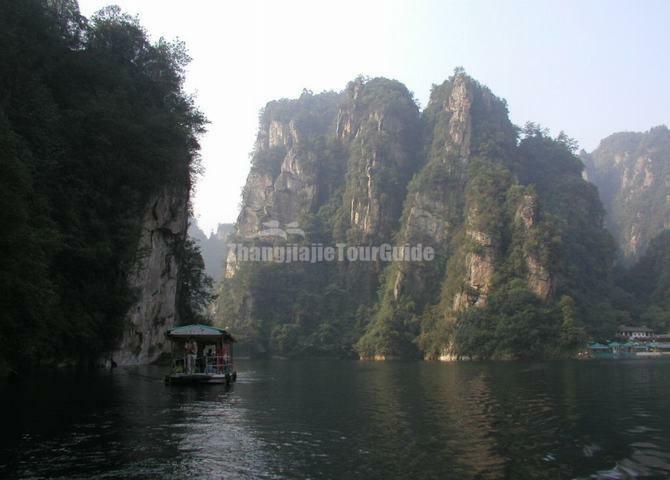 Baofeng Lake is located in Suoxi Valley Natural Reserve, about 1.5 kilometers away from the district seat of Wulingyuan District, Zhangjiajie City. The lake lies part way up the mountain range, 85 meters above the ground, and attains an altitude of 585 meters. Because of its association with the Baofeng Mountain Range, the lake bears the name of Baofeng. With an average depth of 72 meters, Baofeng Lake covers an area of 30 hectares, and can hold 6 million cubic meters of water at full capacity. Its water is produced by rainfall, mountain springs and underground streams, and stays emerald all year around, so it is reputed as the “Paradise in the Human World”. The lake has a fascinating landscape with surrounding mountains and a mid-lake island. The outdoor scene of Hua Guo Mountain and Water Curtain Cave in the TV series "Journey to the West" is taken in the "Striking Peaks and Flying Waterfalls". 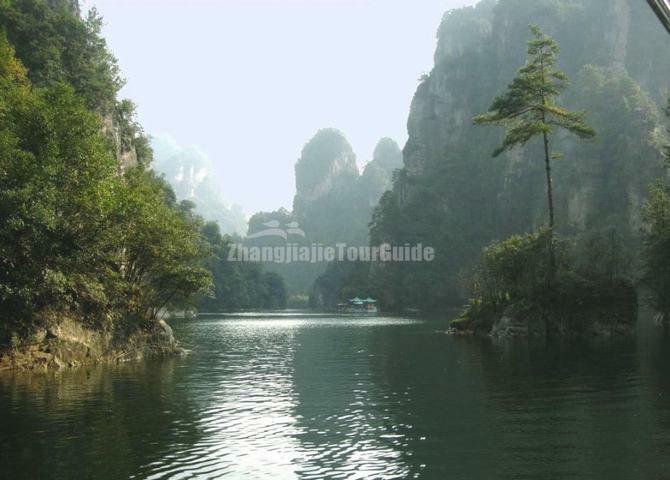 The famous Eagle Nest Stockade is located in the precipice, southwest of Baofeng Lake. It is a famous bandit stockade in the early time and the TV series "exterminating Bandits in Wulong Mountain" is taken in this place. Baofeng Lake is actually not a natural lake. In 1970’s, the local people filled the small faults of the lake with concrete to store water and water level come up and the beautiful lake takes shape. Boat tour in the lake gives a lot of fun with the folk songs by girls in the boat. 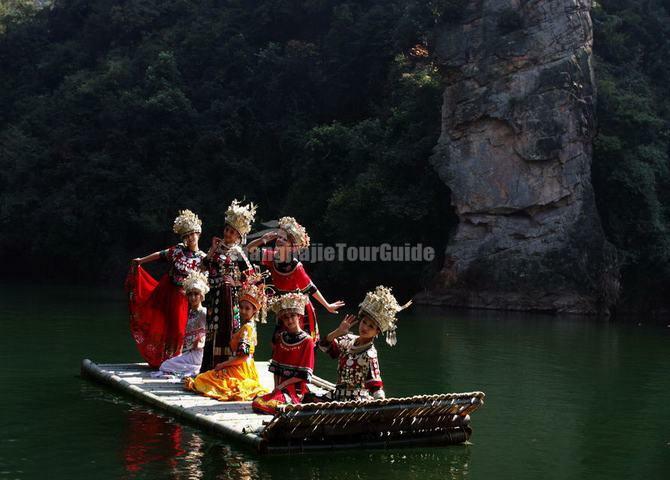 The tourists are expected to interact with the folk song girls by crossing singing, very interesting. Beautiful scenery in the lake area includes: Baofeng Waterfall, Stone Gate Welcoming Guests, Peacock Displaying Colorful Tail, and Golden Toad Biting the Moon, Fairy Lady Reflected in the Lake and so on. 1. Do not throw rubbish in the lake. 2. Bring coat or other warm clothes it may be a little cold when meet rainy days in the lake area. 3. Keep distance with the vendors who sell traditional Chinese medicines. Tourists can first take a minibus (CNY 11, 40 minutes) at Zhangjiajie Long-distance Bus Station to Wulingyuan District and then hire a taxi (CNY 10) or take public bus No. 2 (CNY1) to the lake.